The North Shore location, complimentary parking, package menu options, many choices of elegant ballrooms, the ability to accommodate 10–1,000 people for meetings or banquets - these are just a few of our amenities. Our beautifully detailed design is for all occasions. State-of the-art lighting and sound system make your event special. We have two private suites atop our dramatic winding staircase just outside the entrance to the North Shore Ballroom. 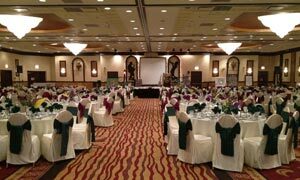 We have more than 15,000 square feet of meeting and banquet space! Our catering staff is knowledgeable and attentive to every detail. Our certified food and beverage executive and certified meeting professional are seasoned event planners who will help plan your event. In addition to Traditional American Menus we offer ethnic and kosher catering. 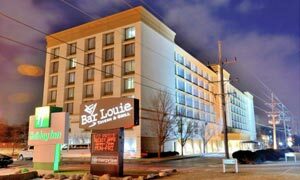 In the heart of Skokie, Illinois is the Holiday Inn Chicago North Shore, home to Bar Louie North Shore and the Skokie Conference and Banquet Center. 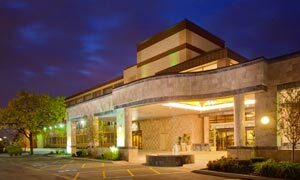 This full service hotel north of Downtown Chicago is surrounded by shopping, attractions and dining. 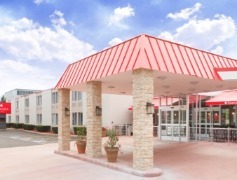 Located just blocks from the Edens Expressway (Interstate 94), and equally convenient access to Interstate 90 & 294 means guests can reach all parts of Chicagoland in just minutes. 244 renovated and fresh guests rooms make up our standard and executive levels. All guests enjoy hotel amenities like free WiFi and parking and access to indoor pool and spa. On site bar, room service, fitness center and convenience store means all your needs can be met on this clean and carefully maintained property. 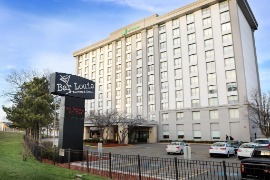 The hotel is centrally located off I-88 between I-294 and I-355 in the beautiful Oak Brook western suburb, nestled in the shopping and restaurant district. The hotel features complimentary shuttle service to all local corporate offices. Our meeting rooms also come complete with audio-visual equipment. Bar Louie extensive menu, as well as a comprehensive daily hot breakfast selection, in a cool and comfortable atmosphere. All 227 beautiful decorated rooms are appointed with everything required to ensure your stay will be an enjoyable experience which includes complimentary high-speed Internet access! The Holiday Inn Chicago O'Hare Airport Hotel (ORD), just minutes from downtown Chicago, offers you quality lodgings near the airport, making us your top choice for comfort and convenience in Chicago. Bring your family to our Chicago O'Hare hotel, located just off I-90 with close proximity to all that Chicago has to offer. Nearby attractions include the Rosemont Theatre, Allstate Arena, Wrigley Field, Millennium Park, Sears Tower and shopping on the Magnificent Mile. 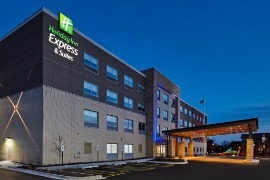 The Holiday Inn Express & Suites in Niles is situated centrally between Chicago's O'Hare International Airport and downtown Chicago. Its amenities are first-class, catering to guests who stay for business or pleasure, including an indoor heated swimming pool, a 24-hour fitness center, a full-service business center, a marketplace to purchase snacks, soda, beer and wine, complimentary parking for cars and buses, an electric vehicle charging station, and a complimentary hot breakfast buffet served each and every morning. All 83 guest rooms and 17 suites are quite spacious, offering a modern contemporary design including luxurious shower and bedding collections, flat-screen TVs with HD channels, a refrigerator, a microwave, a safe for valuables, and complimentary hi-speed wireless Wi-Fi. The 1500 adjustable square feet of meeting and banquet space features modern lighting and state-of-the-art audio visual equipment for business and social gatherings. 1001 N Wood Dale Rd.